Hint – “Eugene W. Bakep” error. Hint – Laser, Ice, Zap, and Nitro. Can you Guess The Set? Tonight around 8:00 p.m. EST I’ll post the correct answer in the comment section and on Twitter. Good luck! Hint – Its not 1987 Topps Baseball or a football set. 22 autographs! 22 autographs! This has to be some kind of a record. I’m not that big of a prospect collector, I only own one Upper Deck USA autograph and thats of Adrian Cardenas. 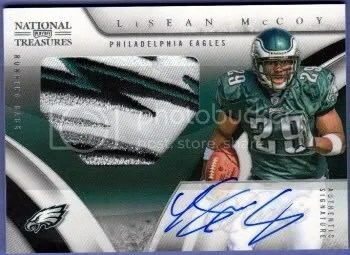 I did have the chance to pickup a Ryan Howard UD USA autograph a few years ago for only $60.00 but I never pulled the trigger 😦 I like the concept of this card a lot. It would be great if they could do this with pro teams and their starting lineups. I’d probably go nuts if I discovered they made a card like this for the Phillies. 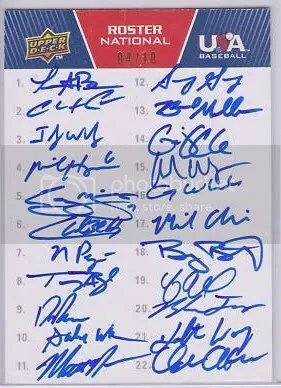 These roster autographs are extremely difficult to pull being limited to only 10 copies.